FREE Employee Discount Coupons offer your employees more fun for their money!! Discount Coupon offers attraction discounts and specials! 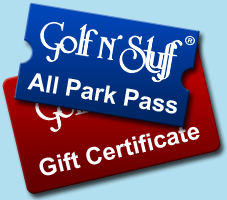 Valid at your local Golf N' Stuff location! This form is for HR/Employee Benefits Administrator/Company Representative use only. Please send me information on fun and delicious employee parties/meetings!